A list of all the stores in City Centre Bahrain mall and their locations in a pocket size map available in both Arabic and English which can be found at the customer service desks in the mall. You will also find static directories available at all major entrances of the mall on the first and second floors. 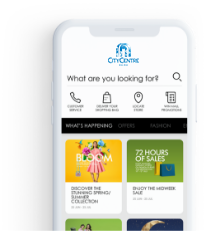 Another way to locate your favorite store is by visiting our website www.citycentrebahrain.com and clicking on the Store Locator.